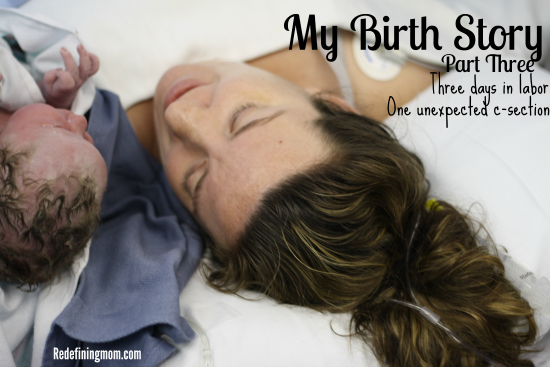 Catch up with Part One and Part Two of my birth story before reading on. At this moment, I lost it. I put up with a lot in the prior three days but they had to do something decisive and stop playing games every time there was a shift change! I demanded that they prep me for a c-section which is pretty sad I had to make this decision and finally the residents (yes, the RESIDENTS) convinced the attending this was the right path and started prepping me for surgery. I was so scared to go into the delivery room. 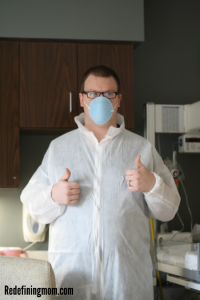 Rob was not able to come with me until I was on the table and ready for the surgery to begin. Both of us were very nervous but after three days of waiting for her to arrive, we were so excited to be so close to meeting her! She was born at 2:29pm on Wednesday, October 17, 2012. She weighed 7 lbs 8.2 ounces and was 19.25 inches long. They had prepared me with an antacid, but this did not help. I am not quite sure if she had been born yet or not but I remember the surgery turned a corner from feeling bad to awful and I started throwing up everywhere. I also lost a lot of blood and became severely anemic on the table, Rob was very worried about me to so I sent him to look after Lydia for the duration of the surgery. Lydia was absolutely perfect! Rob brought her over to meet me for the first time and I cried. When the attending that did not want to deliver me was finished, he turned to the resident on my right side and said “good job for your first time!” Right in front of me as I am bleeding everywhere and going in and out of consciousness (which is not normal) from the blood loss! Rob held her for over an hour in the recovery room because I had lost so much blood, I was unable to take care of her. Everyone was encouraging me to nurse, but I didn’t believe I had the strength to do it. Rob gently pushed me to try so that I could bond with her and she was screaming her head off in his arms. As you can see, I was in desperate need of a blood transfusion, I had lost all color in my face, eyes and lips. It took them 36 hours to get it to me. 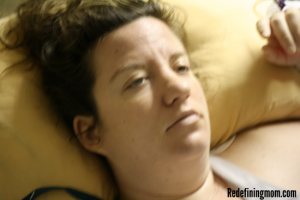 It wasn’t until 5am the next morning that a doctor came to discuss the fact that the anemia was rapidly getting worse. At this point, they had woken me up after I just fallen asleep for the first time in days so I asked them to come back in a few hours. At 9pm on 10-18-12 they finally got the blood transfusion started. I paged the nurse several times throughout that day letting them know I wanted it and that I was experiencing bad symptoms that were related to not having one yet. I am unhappy to say that not only was the care they provided before Lydia was born not reasonable, their lack of responsiveness afterwards was equally unacceptable. No one could give me an answer as to why a doctor could not come and speak with me nor why the blood had not been ordered. It got worse though. I was told Lydia had lost 2 ounces two days after her birth, she was not having an easy time feeding but then the next nurse told me it was actually 1.2 lbs! She was only 7.8 at birth. I demanded they weigh her again and tell me which one it was and they said “it was an error, she only lost 2 ounces.” However, when my pediatrician got there he said it was 1.2 lbs and supplementation was necessary. How could they get that so wrong? It is one thing to not treat me right, but to not be efficient enough to take an accurate weight on my daughter? I hope everyone enjoyed reading my story. The end result is that Lydia is happy and healthy! I still have some issues from the delayed blood transfusion that I don’t think will go away. The most important thing is that Lydia had no long term effects from anything. Continue reading my story after realizing I had post traumatic stress disorder from Lydia’s birth. Well, all I can say is what an absolutely horrible ordeal! That is not how birth should go!!! I would certainly recommend my OB/GYN for your next pregnancy and delivery. She’s the only doctor at her practice, so you’re guaranteed to have her deliver your baby (unless she should happen to be on vacation, but I’m pretty sure she actually books her vaca around the projected due dates of her pregnant clients.) She’s very matter-of-fact, and will tell you exactly what she thinks and exactly what’s going on without burdening you with too much information. Her name is Dr. Diane Morrison and she’s on Maple Rd. in Williamsville. I think she delivers at more than one hospital, but we ended up at Millard Fillmore Suburban, and I have nothing but good things to say about the staff and facilities there. I’m not sure if Dr. Morrison does VBACs, but I know I’ll definitely be going to her for our second. Thank you Laura! I will be looking into a new provider at the beginning of 2014! Recommendations mean a lot, I need to know others had good experiences before I move to any old doctor. My gut says I will end up just going for the c-section but I figure at least discussing the option of a VBAC isn’t a bad idea! Andrea- I got totally sucked in by your story, thank you so much for stopping by and sharing with me. I really appreciate it! 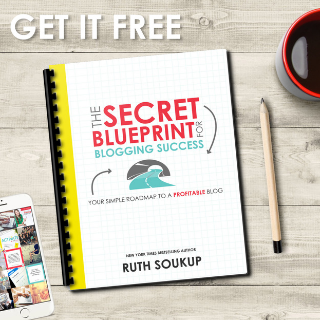 I just came across your blog today via your open letter to Gweny! Great by the way! I love birth stories of all shapes and sizes and I’m so sorry to hear how detrimental yours was! Having a baby is such an amazing thing and it’s a shame the hospital took that away from you! Is there another hospital in your area that you can go to for your next birth? Seems like this one is bad all around! Also, maybe consider getting a midwife/doula to be there to advocate for you since you may not be able to express what you really need! I wish you the best of luck on your next birth! 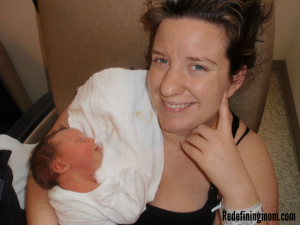 Check out the Bower Power blog, she just had her 3rd baby and 2nd VBAC. Thank you for the suggestions Shelley! There is a different (hopefully better) hospital in the area and I just switched doctors as well in anticipation of getting pregnant again soon! Thanks for stopping by! What a terrible experience. 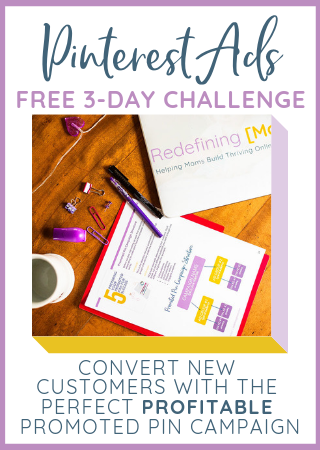 I came across your blog from Top Mommy Blogs – working moms category. I fortunately have access in San Diego to an amazing birth center run by midwives within the UCSD hospital, so I delivered both of my girls naturally with amazing support and the ability to make my own decisions about my births. 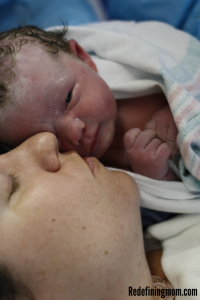 I recently wrote a blog entry about “natural” childbirth, which I believe should be far more normal than it is. Unfortunately, as in your case, interventions are turned to so quickly when nature doesn’t fit perfectly into the hospital’s rigid standards. http://crossbabybump.blogspot.com/2014/03/natural-childbirth-should-be-normal.html My birth stories are also on my blog (July 2011 and May 2009) In any case, I hope for a speedy conception for you, a healthy pregnancy and a much different experience for your second birth. I strongly recommend hiring a doula. You can research, get recommendations and interview to find the right one. She is worth her weight in gold, since shes there with you from start to finish to be your advocate and voice, regardless of the hospital, the staff changing shifts, etc. thank god … everything ended up fine….I wonder why these hospital people so irresponsible…they made error is a very simple thing like weighing a baby..hmm..
Oh my gosh! What a story. I was very lucky to have private health cover which enabled me to have my own doctor throughout and guaranteed to have one of 3 doctors delivering. I was also very lucky to have straightforward births. I think there are some hospitals that are loathe to do C-sections and leave it too late – which tends to result in these horrible births. Thank you for sharing your story. I had triplets 6.5 years ago and had a LOT of problems with the doctors treatment/the delivery/after birth and have since diagnosed myself with PTSD. I know what you are going through even though our stories are different. I wrote a letter to the hospital about 2 years ago while pregnant with our 5th child and though I appreciated their response, I am still emotionally and physically scarred from that time. I had a VBaC at a birthing center with a midwife because I was scared to even try one within a hospital setting. My daughters birth was amazing. I’ve experience 1. vaginal birth in a hospital with a nurse midwife 2. hospital c-section and a natural birth with midwife. I would repeat 3 over again any day then have a c-section or work with doctors at a hospital. My heart is drowning while I read your story. I had my first baby 2 years back and it was a horrible experience with the c-section and hospital authorities. I wish all ladies best luck for their upcoming motherhood.